St Kilda is an inner suburb (neighbourhood) of the metropolitan area of Melbourne, Victoria, Australia, 6 km south-east of Melbourne's Central Business District. 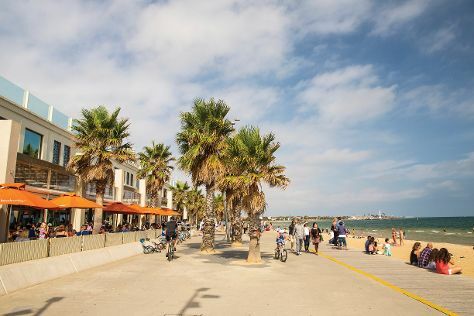 Start off your visit on the 12th (Tue): kick back and relax at St. Kilda Beach. On the 13th (Wed), you'll have a packed day of sightseeing: see the interesting displays at Scienceworks, then buy something for everyone on your list at Chadstone - The Fashion Capital, and then enjoy the sand and surf at Brighton Beach. For reviews, where to stay, other places to visit, and more tourist information, read St Kilda trip maker site . Auckland, New Zealand to St Kilda is an approximately 8.5-hour flight. You can also drive. The time zone difference moving from New Zealand Standard Time to Australian Eastern Standard Time (Victoria) is minus 2 hours. Expect a bit warmer weather when traveling from Auckland in February: highs in St Kilda hover around 30°C, while lows dip to 17°C. Wrap up your sightseeing by early afternoon on the 14th (Thu) to allow time for travel back home.